A winged scapula is also called scapula alata. This is a condition in which the shoulder blade formed by shoulder bones media end protrudes in an abnormal shape and position on persons back. The abnormal scapula gives the shape of a wing and thus called winged scapula. This condition can be caused due to damage to several nerves or muscles. This posture can be normal in young children, but not in older children or adults. 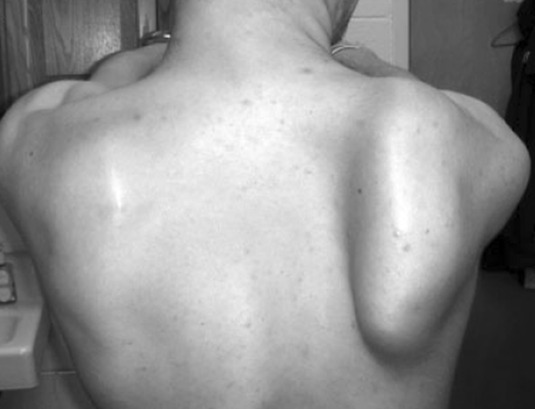 Trapezius and rhomboid palsy can also lead to winging of scapula in less common cases. The injury can be directly to the muscles involved or the nerves supplying them namely: accessory nerve and dorsal scapular nerve, respectively for both muscles. The damage to the nerve or muscles causing winged scapula can be due to some injury due to blunt trauma or any surgical procedure. The clinical presentation of winged scapula can vary depending upon the muscles and/or nerves involved. Pain isn’t present in all cases, however fatigue is common along with limitations of daily activities of the patient. There is clear deformity of back, specially in serratus anterior muscle involvement. While trying to contract the muscle it might clearly wing the scapula. This can be demonstrated by asking the patient to push against a resistance, such as a wall. The patient might have limited ability to lift the arm above their head due to impairment of the movements involving scapula and scapular muscles. Physiotherapy (physical therapy) is one of many treatments available for winging of the scapula, specially if there is weakness of the glenohumeral joint muscles. However if the physiotherapy fails in making the muscles strong enough to contract clinically and symptoms persists after 3-6 months of treatment, surgery is considered to be the next choice in correcting the condition. Surgical fixation of the scapula is done for those who have isolated scapular winging. Other options include neurolysis, intercostal nerve transfer, scapulothoracic fusion, artherodesis or scapulothoracis fixation without arthrodesis.